"This place is simply just amazing, such harmony and peace!!" 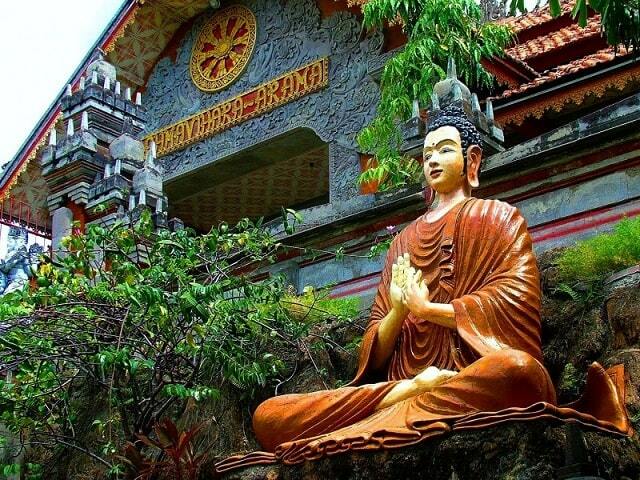 Brahma Vihara Ashmara is a Buddhist temple and monastery in northern Bali, near Lovina. It's more than just a "tourist attraction". It is still in use, and you can meditate here and stay in the Ashram (community and meeting place). The Brahma Vihara Ashmara is the largest Buddhist temple in Bali. It is located in a hilly area near the village Tegehe, about 22 km west of Singaraja and at 11 km from touristy Lovina. The Buddhist temple is not touristy, the entrance is free, but donations are welcome. Even sarongs, you need to enter the temple, are free. The Buddhist temple is located in the hills and offers a nice view. It is believed that Buddhist monks in the 6th century settled in the north of Bali. So the Buddhist influence on the Hindu religion of Bali is noticeable. The terraced complex has a few meditation rooms with golden Buddhas, and there are a number of Buddha statues in the garden. 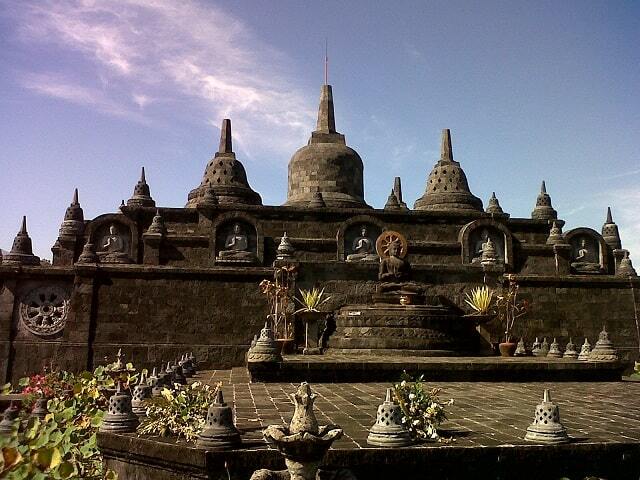 On the highest terrace of the complex is a stupa, which is a small version of the Borobudur in Java. In the temple you will find references to Borobudur. Ashmara Brahma Vihara is a Buddhist temple, which was built between 1960 and 1970. Officially the temple was opened in 1973. Actually there was a Buddhist temple built near the hot springs of Banjar Tegehe, but there were at that time only a few followers of Buddha. As more and more Buddhist became followers, the Brahma Vihara Ashmara was eventually built on a large plot of land. Large enough to build, so a miniature of the Borobodur was built is the southern part of the Brahma Vihara Ashmara. Upasatha Gara: this is on top of the western hill. It is a comfortable and quiet place. On the wall there is a picture of Buddha's birth to see and in the middle there is Buddhist statue when he attained enlightenment. This space was used for religious and ritual activities of the candidate monk. Here the candidate monks laid their promises. Dharmasala: located in the eastern region. Dharmasala room is kind of a space for giving lectures. This room is also a place for giving sermons and other spiritual activities. Stupa: a giant bubble-like building in the northwest corner. The walls are made of concrete with a cut in relief, which is very interesting. In the Stupa they kept much sacred Buddhist things, which were light and flammable. Bodi tree: in the north there is a large Bodi tree, which is decorated. Under a bodiboom Buddha attained enlightenment. 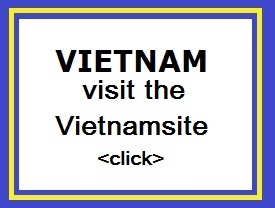 This site visitors usually come for meditation especially ASUDA and Waicak days. Kuti: in the Vihara complex there are rooms which are called Kuti. These rooms are for monks and students who study here. But it is also a place where the monks practice. If you look carefully in the tmeple you will find many Buddhist statues. Below are two beautiful: a Parinirvana and a Buddha statue. Both are made of bronze and they are covered with gold leaf from Thailand and Sri Lanka. These statues can be found in different rooms. The Buddhist Parinirvana is a reclining statue, before traveling to nirvana. There are about 31 more images. They are made of sandstone or concrete and they are bearing the sign, that there are 31 different levels (or worlds) in which beings can be born again. Major holidays like Waicak or Wesak (Buddha's Birthday) are celebrated at Purnamasiddhi (Full Moon). It's usually in late May / early June. WESAK: the feast of the enlightenment of the Buddha. This is usually celebrated on or around the full moon in May. PARINIRVANA: celebrating the passing and reaching and the final Enlightenment of the Buddha. 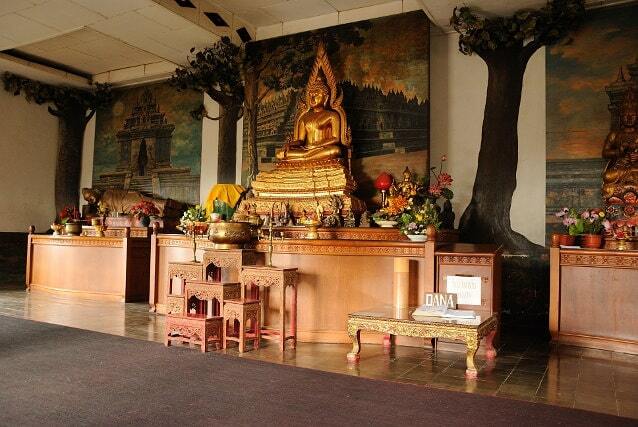 Brahma Vihara Arama Monestry is a place of peace, tranquillity, serenity, harmony and beauty. It is high in the hills over looking Lovina and very worth a visit Buddhist or not. It radiates an air of calm and peace. Sarongs are available at the entry point along with a donation box, as entry is free. Please do not take advantage of Buddhist good nature and leave a donation. Shoes must be removed before entering the temples and areas of prayer. Take some time to explore the beautiful surrounds, peace and harmony of this beautiful Monastery. Most appreciated if you are a Buddhist as I am...you will want to meditate and take prayer.